Andrew: Have we reached another milestone? Does this qualify as our first truly iconic episode of Last of the Summer Wine? 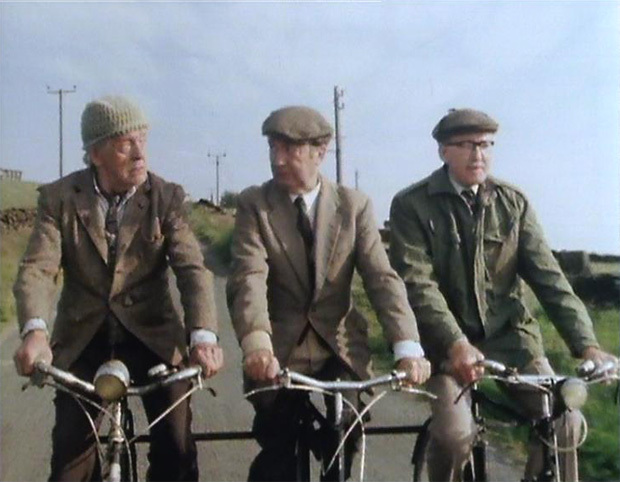 I think that clip from the climax of this episode, in which our trio tumble headfirst over the handlebars of their bicycles, is probably one of the most often used to represent the series in documentaries or highlights packages. Andrew: I’d have to check the novel again to see whether it originates there, but the gag with the trio careening down a hill upon one bicycle is used again, in almost identical fashion, in the Getting Sam Home feature-length special the following year. Andrew: And who would have thought that a thirty-year-old episode of Last of the Summer Wine would become so topical in hindsight? Not too long ago, a video in which former American sitcom star Kirk Cameron and Christian minister Ray Comfort displayed support for the ‘Banana Theory’ went viral. The Banana Theory, in case you’re wondering, posits almost exactly what Clegg states in this episode, ‘If there’s no guiding hand behind the universe, how come bananas are just the right shape for your mouth’. Have a look! Andrew: Another couple of names for the database; Lily Matthews – With his scruffy khakis, Compo never had a chance with this RAF-mad girl. Lily was ugly, but only from the front. Then we get Mildred, a loud welder, apparently. 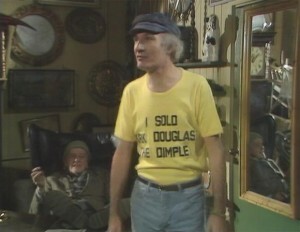 Good to see Dirk wearing a classic comedy slogan T-Shirt as well… ‘I Sold Kirk Douglas The Dimple’ is emblazoned unashamedly across his chest. The comedy T-shirt is a quintessentially 1980s phenomenon, and a couple of years before this episode aired you could barely move in Britain’s High Streets for ‘I Shot JR’ T-shirts hanging from shop windows. And wobbling beer guts. The practice still exists in the minds of weird 50-year-old men who proudly strut around in public wearing hilarious ‘If Found, Please Return To The Pub’ T-shirts, but the rest of the world – thankfully – seems to have moved on. 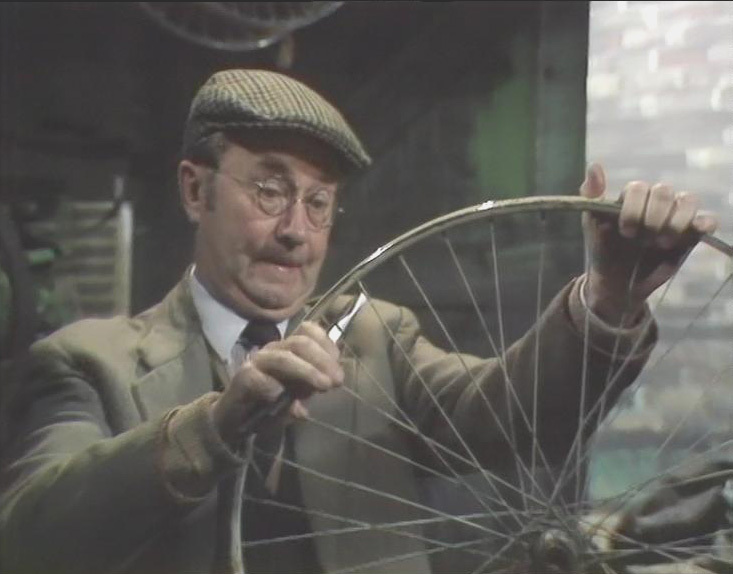 Andrew: One thing that really strikes me about this episode, particularly the scenes where the trio are putting their bicycles together, is just how much fun they’re having. There’s little in the way of moaning or complaining, and just look at the glee that Foggy and Compo exhibit when gently ribbing one another for their efforts. It’s a little bit special and reminds us why these characters continue to knock about together, despite their many setbacks and fallings-out. Andrew: In a move that I expect will upset you, Sid’s Café has undergone some extensive renovations, doing away, as Clegg puts it, with ‘the homely air of neglect’. This doesn’t bother me at all, however, as the set now looks exactly as it did when I was growing up with the show. I think this was my first burst of nostalgia. I wonder if this move to brighten the place up is part of Alan J.W. Bell’s influence on the series. Bob: Ha! I’ve written exactly that in my notes.‘They’ve redecorated – I don’t like it’. I suspect that, if we watched one of the Blamire episodes again, we’d be surprised at how filthy and run-down all of the sets and locations look in comparison to this brave new era. There was a real grimy, soot-stained bleakness to life in 1973 that was beginning to fade from sight in the spruced-up, computerized 1980s. Andrew: If Gladwin had stuck around for a few more years I’m sure Roy Clarke would have had him dressed up as Carmen Miranda. They’ve redecorated. We don’t like it. Bob: Yes, Foggy joins three bikes together by the handlebars to make a treble-seated monster, and it’s absolutely believable. The scenes in which they road-test the bike look lovely as well… freewheeling fun on a bright summers day. 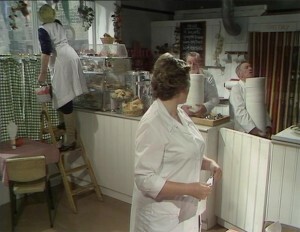 Andrew: I also really enjoyed the scene with our trio attempted to eat ‘continental style’ outside the café. Ronnie Hazlehurst’s Parisian take on the series’ theme tune is beautiful, and the action is taken straight out of a Laurel and Hardy or Chaplin short from the silent era. Bob: Absolutely! ‘They’re going to get it continental style’, deadpans Jane Freeman, refusing to allow our scruffy trio to slurp their tea in her newly-refurbished café. It’s such a well-worn 70s double entendre that I heartily applaud Roy Clarke for having the audacity to use it! There’s a whole scene in Are You Being Served – The Movie in which Captain Peacock and Mrs Slocombe debate whether they’d prefer it ‘English or continental style’. Their breakfast, of course. What else? I really love this episode, I think it has just the right mix of slapstick, character comedy and wistful nostalgia. I love Clegg sharing in first Foggy then Compo’s teasing at each other. Thanks Jakob, that’s fascinating stuff. And yeah – this is easily one of my favourite episodes of recent series. Proper lovely, that. One of the things about LotSW from this period is the fact that Clarke hasn’t drifted into formula so much. In much later years, you’d have that sharp divide between the women speaking amongst themselves (with tart, pithy one-liners about the incompetence of men), and the men doing something simliar, with the twain meeting not all that often. What I think is great about this era is that nailing of the ritual of male bonding. The article mentions it tangentially, but I think it’s nice to think about it a bit more. Lots of groups of male friends do have this peculiar practice, however close they may be, of spending most of their time trying to wind each other up or doing some fairly harmless point-scoring off each other. In fact, the amount of “needle” runs roughly in inverse proportion to the closeness of the friendship. In the modern post-lad era this has become the rather tiresome phenomenon of “banter”. Here, it’s just three old friends shooting the breeze. I know which I prefer. And, once again, Sid gets the show’s best line: “It’s all right for you. She just throws you out. Me, she keeps!” Fabulous. Seems like a really busy episode, which starts at pace with Compo’s “electric” sock… “suddenly it’s high summer and your banana’s gone”… 3 men on 1 bike, as last seen in “Forked Lightning”… a glorious one-off scene with Joe Melia, another one regretting a lack of war… the bike-building skit where Foggy and Compo make near-identical chats to Clegg about each other… the whole café sketch with Nora and Wally given responsible jobs, especially Wally’s regret not to be making bikes… the whole silliness at eating in the street… the physical problems of trying to do something different with bike designs… the final compromise, and its inevitable consequence… one of the greatest episodes.